There was an old house that had once been beautiful and grand. It sat on a road with many other beautiful, grand homes, but over time it began to fall into disrepair until one day its windows were boarded up and it was abandoned. In order to hide its sad state from the others, the boards on the windows had been painted to look like windows; dark panes of painted wood trimmed in white had replaced the clear glass. To the many who drove past the old house barely sparing it a glance, the evidence of its downfall was easier to ignore once those painted boards had covered broken windows. Eventually, the decay and disrepair reached a level that the city decided the house was an eyesore and a danger. It was decided that the once beautiful and grand house would need to go, to be torn down. Yet, just as all looked lost for the house, someone took a closer look and saw past the overgrown yard, the damaged roof, and the boarded up windows. With dedicated care and work the house was restored. We are all in danger of becoming the house. Without maintenance and care, we can go from a place of beauty and love to a place where we board up our windows and fall into decay. The Lord’s mercy and love, His atonement for our sins can help save us. It is important that we remember this when we feel as if the storms of life are ripping at our exteriors and the wind and rain begins to seep into our souls. The Lord admonishes us to learn of Him and to take His yoke upon us. He teaches us to be mindful of our brothers and sisters. 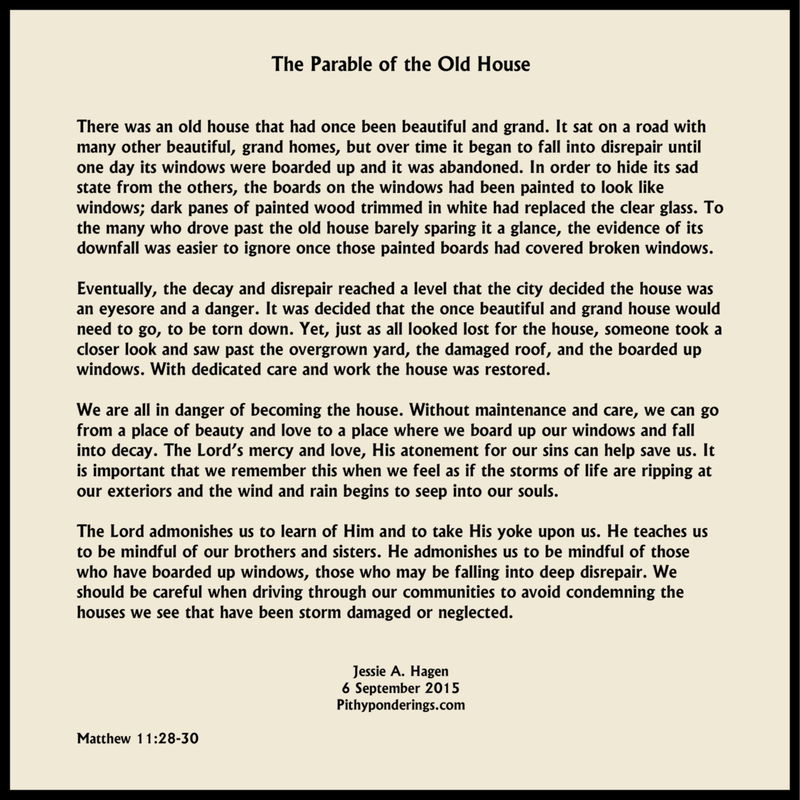 He admonishes us to be mindful of those who have boarded up windows, those who may be falling into deep disrepair. We should be careful when driving through our communities to avoid condemning the houses we see that have been storm damaged or neglected.